“You’re supposed to be at home” taunted the travelling Green Army during Ireland’s 2011 European Championship qualifier away to Andorra. How the Andorran support might have responded we’ll never know as he was getting a burger at the time. Had it been an incident in isolation, one would have assumed the Irish fans’ taunts of their opponents’ miniscule support was an example of them engaging in ironic footie banter, the type perfected at such celebrated football cathedrals as Anfield or Old Trafford. However, the Irish faithful have form when it comes to terrace faux pas. Whether it’s booing obscure Georgian full-backs who happened to have once earned a wage with Glasgow Rangers, hated enemy of the Irish fan’s team, Glasgow Celtic (don’t let the fact that Celtic are located in the UK, pay taxes to the Westminister Government or compete in a UK championship confuse you, they’re definitely Irish! ), or obediently paying extortionate ticket prices to the FAI (an organisation that makes Irish banks look prudent), the Irish fan is, indeed, a breed apart. 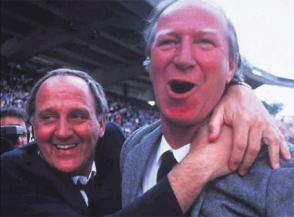 But nowhere is this more apparent than in their deification of former manager Jack Charlton. Charlton – or Saint Jack, as the Irish fan would rather he be monikered – is the man who famously refused to pay cash when patronising bars and restaurants on the Emerald Isle during his tenure, instead preferring to write cheques, safe in the knowledge they would never be cashed, so keen were the proprietors to have the Great One’s signature. Manys the Irish fan who would see any attempted revision of the Geordie’s tenure as nothing short of sacrilegious, so imbedded are they in their belief that Charlton did for Irish football what Steve Staunton subsequently did for Irish comedy. But a recent Late Late Show interview with former Irish midfielder Ronnie Whelan raised a few interesting points. Briefly foregoing their usual diet of vacuous ‘glamour’ models and soap stalwarts, the national broadcaster’s flagship show decided to treat us to that rarest of guests – a person with something interesting to say. A player during the most successful period in Liverpool’s history, captain in their darkest hour at Hillsborough in 1989, Whelan was interesting throughout the interview, but never more so than when discussing Charlton. When asked why he thought the former manager shunned him at the 1990 World Cup in Italy in favour of such a clearly inferior player in Andy Townsend, Whelan speculated that it may have been down to an anti-Irish streak he believes Charlton to have possessed. Had Whelan’s case being unique, a steady stream of ridicule would surely have followed the Dubliner’s theory. But his case wasn’t unique. Under Charlton’s reign gifted Irish-born players were routinely eschewed in favour of pedestrian Cockneys, Scousers and Glaswegians, with the captain’s armband most often worn by Yorkshire’s Mick McCarthy or Maidstone’s Townsend. If you mention such a point to the typical Irish fan they will counter that Ireland enjoyed ‘massive success’ during the Charlton years. But were those years such a huge success? When one considers the pool of truly world class players at the Englishman’s disposal throughout his tenure, the more valid viewpoint would seem to be that Ireland, between the mid 80’s and mid 90’s, actually underachieved. Players such as Whelan, Liam Brady, David O’Leary, Frank Stapleton, Paul McGrath, Pat Bonner and Kevin Moran were all seasoned winners, routinely challenging (and often winning) league championships, FA Cups and European Cups. Almost all played in great footballing sides too, Whelan learning his craft under the tutelage of the great Bob Paisley, to this day one of the few managers to have won three European Cups. Is it so far fetched to believe that Ireland could have utilised these players in the same manner as their club sides, playing to their strengths and not asking them to play the type of Neanderthal hoofball favoured by Charlton? That is, when he picked them at all. When one considers the paucity of talent in the Argentina side that reached the 1990 final (an unfit and misfiring Diego Maradona still by far their best player), is it not reasonable to suggest that an Ireland team featuring the abovementioned players should not have at least done better than their quarter final exit, achieved after four of the most turgid, negative performances the World Cup has ever witnessed? “But if it weren’t for Charlton we never would have produced Robbie Keane or Damien Duff” is another popular refrain of the Irish fan. The duo, so the argument goes, were so inspired by the dizzying heights reached by the Irish team under Charlton’s management that they decided football was to be their sport of choice (reports that Keane only did so after swapping the burgeoning Tallagh Polo scene with the hitherto little known ‘soccer’ scene have never been substantiated). But the argument poses more questions than it answers. For starters, two players? Is that it? Supposedly the most inspiring period in the history of Irish football only produced two players, neither of whom are of the same calibre as their 1980’s predecessors (aside from a brief spell at Chelsea, Duff’s career has been a case of what might have been and few fans of Keane’s many clubs have lamented the striker’s departure). Besides, if the Charlton years inspired Keane and Duff, what era inspired Brady, Whelan, McGrath et al? The more likely explanation is that Keane and Duff were merely two more boys among hundreds of millions worldwide for whom a career as a professional footballer held the same exotic allure as it did for boys in the 1950’s and indeed, continues to do so today. Perhaps the most galling aspect of the Charlton era, though, is the feeling of what might have been. For Charlton’s appointment in 1986 only came about after the FAI, in a trademark display of astounding football ignorance, chose the Geordie over the aforementioned Paisley. Recently retired from his Liverpool role, the avuncular Paisley was said to have been deeply disappointed at missing out on the Irish post – and with some justification. After all, if you had just led a team to eight championships and three European Cups, you too would no doubt feel aggrieved to miss out on a job for whom your only rival was a man whose greatest achievement in management was losing an FA Cup semi-final with Sheffield Wednesday. The likelihood of the Irish fan ever viewing Charlton in anything other than a beatific light is slim to none, however, such is the inevitable embellishment of one’s achievements that comes with nostalgia. Charlton aside, one person who must be hoping the reality of ‘Big Jack’s’ era never dawns on the Irish fan is his bank manager, lest his client’s balance be severely dented as all those proprietors cash all those cheques.